1443 Royal Scots Dragoon Guards. TRF. The Royal Scots Dragoon Guards, TRF patch. ..
1444 The Light Dragoons. TRF. The Light Fragoons. TRF patch. .. 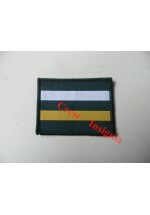 The Royal Army Physical Training Cotps, TRF patch. .. The Gurkha Brigade. TRF patch. ..
Royal Army Chaplains Department. TRF patch. ..
1451 United Nations Identification patch. 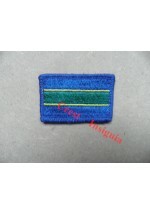 United Nations attached personnel, identification patch. 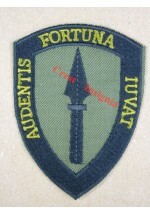 ..
1459 ARRC attached, TRF patch. 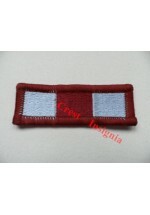 Allied Rapid Reaction Corps, attached personnel TRF patch. ..
1460 Rheindalen [BAOR] Support unit TRF. British Army. Rheindalen [UK forces Germany] Support Unit. TRF patch. ..
1461 London District personnel TRF. UK Forces. London District personnel. 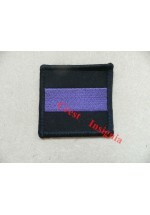 TRF patch. ..
1462 Brunei Garrison personnel TRF. 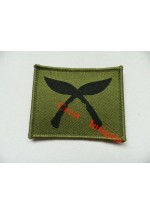 Brunei Garrison [jungle training base] TRF patch. ..
1469 AFPU [film & photo] TRF. 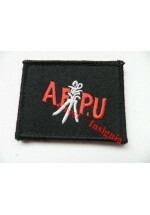 Army Film & Photographic Unit, TRF patch. ..
United Kingdom. Joint HQ [Northwood] attached personnel. TRF patch. ..
British Forces. Jungle Warfare Training School. TRF patch. ..
First Aid Nursing Yeomanry. TRF patch. ..
1475s Joint Helicopter Command. TRF. Subdued. Joint Helicopter Support Unit. TRF patch. Subdued. ..
1477 1st Military Intelligence Brigade. TRF. 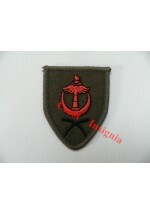 1st, Military Intelligence Brigade. TRF patch. ..
1482 Queens Royal Hussars TRF. The Queens Royal Hussars TRF patch. .. The Royal Yeomanry. TRF patch. ..
1484 CDTT [drug testing team] TRF . Compulsary Drug Testing Team. TRF patch. ..
1488 Training Team [Kenya] TRF patch. British Army. Training Team [Kenya] TRF patch. ..